Owner/Investigator Don Treco retired from state law enforcement with twenty years experience in investigations including surveillance and successful prosecutions, courtroom testimony and more. In over seventeen years as owner of Gumshoe Detective Agency Don Treco has appeared on the Judge Mathis television program in Chicago, consulted in the Natalie Wood death case, consulted for television programs, and assisted researchers in the famous Zodiac serial killer case (Calif). He is also a member of a select group of Amelia Earhart researchers and gives presentations about her disappearance, one of the most enduring mysteries. He started Gumshoe Detective Agency in 2001 conducting and managing private investigations along with his staff in and around the Sacramento Valley, Sierra Foothills and beyond for private party clients and their attorneys. Many of Gumshoe’s investigators have law enforcement backgrounds, criminal justice experience or other specialized skills which help make Gumshoe Detective Agency stand out from the rest. Having retired from the CHP as a Flight Officer in Fixed Wing aircraft he pilots his own aircraft with Aerial Investigators to conduct Aerial Surveillance adding that unique asset to the many assets of Gumshoe Detective Agency. Our mission is to provide the highest level of professional private investigative services to our clients, no matter how small nor how large the case. Our philosophy is to maximize due diligence, with the client’s need to discover or prove the truth being paramount, so the client will have the answers and peace of mind needed. Established in 2001 at Auburn California and carrying on the tradition of the early Gumshoes using modern technology with long proven traditional investigative methods. 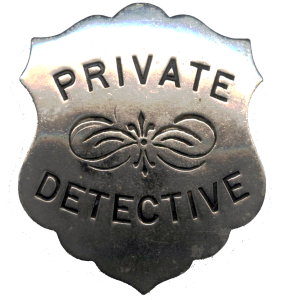 We have more than 15 years in the private investigation business, and many of our investigators come to us with law enforcement training and experience as well. We aren’t one investigator doing investigations out of an unused room in the house as a hobby. We are a team of experienced, professional and well equipped investigators, which translate into our being available at all hours, and every day of the week. We understand our clients may not have a lot to spend on investigations. We also understand what the current economy’s effect on individuals and families is, and we will work with you to help you get the answers you need for what you can afford. In addition to our street sense we use state-of-the-art two way radios for surveillance and tactical operations, surveillance countermeasures electronics, GPS tracking and even aircraft to meet the needs of the client. Clients can view their case as it progresses with their own secure login to our secure client web portal 24/7 and can even add case information for the investigators working their case to review. Utilizing sophisticated case management software clients see accurate and detailed billing on how the case is being worked. We have our own aircraft for aerial surveillance, photos and more.